Trump escalated Obama’s war on Syria, continuing to use ISIS and other terrorists as imperial foot soldiers he vowed to combat – instead supporting them like his predecessor. Syria destroyed its CW arsenal. 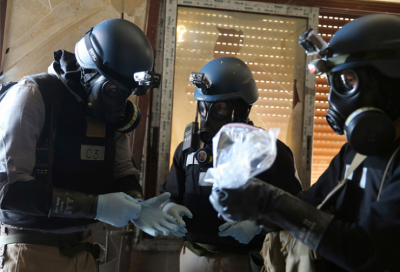 Elimination began in September 2013, the operation completed in late June 2014 – confirmed by the Organization for the Prohibition of Chemical Weapons (OPCW). No evidence shows any CWs remain in the hands of its government or military. Claims otherwise are false. No evidence supports them. US-supported terrorists alone continue using toxic agents, largely against civilians, incidents falsely blamed on Damascus, a likely sinister Trump administration plot to justify attacking its forces, putting conflict resolution further out of reach – risking confrontation with Russia. The objectives of both countries are world’s apart on Syria and other geopolitical issues. Russia supports diplomatic resolution of all conflicts. Washington wants them continued – in Syria for regime change, aiming for another imperial trophy, along with isolating Iran ahead of targeting its government for regime change. In late January, the Bulletin of the Atomic Scientists moved their doomsday clock closer to midnight – reflecting an increased risk of nuclear war or ecocide since Trump took office. A ticking time bomb reflects world conditions – hugely dangerous flashpoints on the Korean peninsula, in Ukraine, Syria and elsewhere. Washington’s endless wars, its rage for transforming all sovereign independent countries into US vassal states, no matter the risks or human toll, bears full responsibility for what’s going on – a combustible situation risking nuclear war. The Henry Wadsworth Longfellow’s phrase “Whom the gods would destroy they first make mad” applies to US administrations and bipartisan lawmakers – especially today with neocons infesting Washington. The NYT, CIA-connected Washington Post, Wall Street Journal, CNN, and other US media scoundrels continue publishing false reports of Syrian CW use – every time an incident allegedly involving these weapons surfaces, repeating claims by Trump administration officials without due diligence checking. The above remarks lack credibility – a disgraceful attempt to blame Syria and Russia for alleged and real CW attacks by US-supported terrorists, Pentagon contractors training these elements in their use. Haley disgracefully blamed Assad for the alleged incident, falsely claiming he’s used chlorine gas “multiple times in recent weeks” against civilians – an absurd accusation. Syria forces have been defending their people for seven years against US-supported terrorists. Washington and its rogue allies alone benefit from CW incidents, why so many are staged by ISIS, al-Nusra and other terrorists they support. Washington and its rogue allies want endless war and regime change in Syria, not diplomatic conflict resolution. They’re going all-out to prevent it, including by terrorists they support launching CW attacks, falsely blamed on Damascus.